On Wednesday, August 2nd at precisely 6:07AM, I pulled my right calf. Yes, I know the exact date and time because I was running with my friend, Cortney and we were heading up a hill just outside of the Donner Picnic Site to meet more friends, Audrey, Tiffany and JP, for a run on Drunken Deer. My calf had been tight since the night before and suddenly, I felt a pop followed by pain and an inability to run or even walk without a limp. #@&^!! Damnit! #@&^!! #@&^!! #@&^!!. #@&^!! All the bad words! I had literally just signed up for the Sierra Crest 30K two days before this happened and planned to run the race in three days’ time. #@&^!! Damnit! #@&^!! #@&^!! #@&^!!. All the bad words! Needless to say I was in a very bad mood for the rest of the day, but then managed to convince myself that it really wasn’t that bad and I just needed to stay off of it for a day and it’d be fine. Fine! It will be fine damnit! Wear a compression sleeve, ice it, ignore the limp, ignore the pain – mind over matter right? It. Will. Be. FINE! Yeah, not so much. Three days later, Abe (my husband) and I headed to the Alder Creek Adventure Center for the start of Sierra Crest. 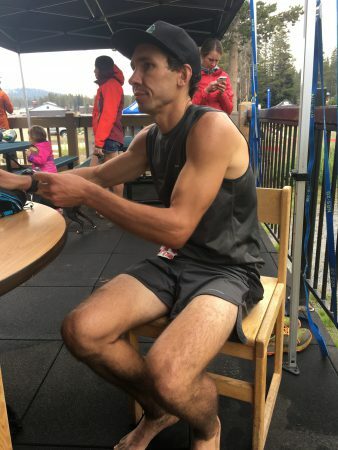 Our plan had been for him to run the 50K which starts an hour ahead of the 30K, catch up with me on the 30K course and then we’d run together for whatever portion remained of the race. The 50K started and I sent him off with a kiss, a pat on the behind and a “see you in a little bit”. An hour later, the 30K started and I was limping from the first step – this was not going to end well. A little running guardian angel (eh hem – Carol Lindsay) called out to me “Mone’ you’re limping”. Yes, yes I know, but maybe it’ll loosen up. It’ll be fine. FINE! I swear – it’ll be fine! Nope. It did loosen up for a bit, but was never pain free. Then the pain started to get worse and three miles in, I decided to throw in the towel and accept my first DNF. It wasn’t worth a long term injury. Discouraged, defeated and depressed, I turned around and started my hike back to the Adventure Center. I crossed paths with Abe about a mile and a quarter on the way back. This was not how we had planned this. Nonetheless, I could tell he was having a great race thus far and was so excited for him. Another quick kiss and he was on his way. I proceeded down “The Path of Defeat” [read with an ominous, gruff voice]. No swear words, no feisty defiance – just depressed resignation. I decided that I would allow myself to wallow for a few hours and then buck up in time to go watch Abe finish. He called me about an hour away from finishing so that I could be there in time. Of course Abe finished a lot faster than he expected and I managed to miss it by about five seconds. Abe had a great race and was pretty happy as a result. I’d like to say that it was contagious but I’ll be honest in that although I was happy for him, I was still depressed about what I was coming to terms with as a legitimate injury that wasn’t going to miraculously vanish any time soon. 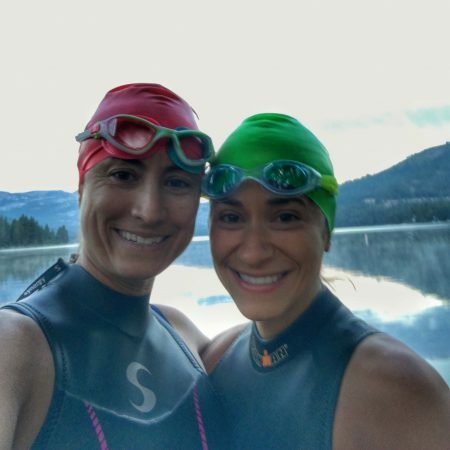 I managed to talk Cortney into swimming Donner Lake with me from East to West. I love that Cortney and I can talk each other into almost anything. Everyone needs a friend like that – especially when you’re going through a break up. So yeah – we did that on Wednesday, August 16th bright and early in the morning. It took us about an hour and a half to swim the three miles from the TD Beach to West End. Queue singing angels….. 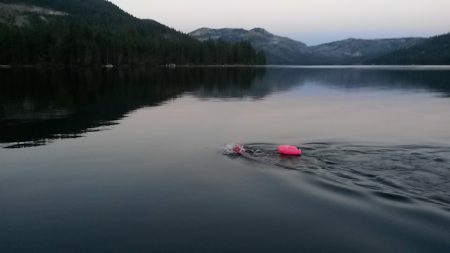 I got to thinking that if swimming East to West was that awesome, what about swimming AROUND Donner? 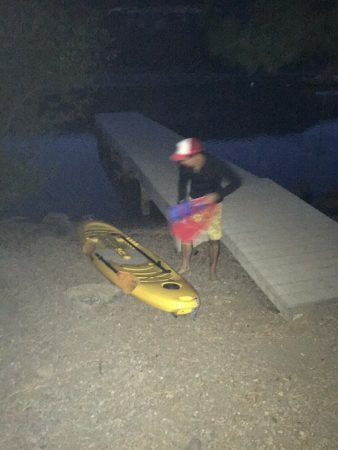 Searching online for a swim around Donner turned up absolutely nothing. I remembered that Rich Molsby had circumnavigated Donner a couple of years ago so I reached out to him to get some insight. Turns out he had done it solo and not as part of an organized event or race. He recommended swimming it after Labor Day and early in the morning. Alrighty then. Hold that thought. Well, as fate would have it, my father in law was going to visit that Monday through Wednesday and Abe and I would have childcare if we wanted to get out for an adventure together. 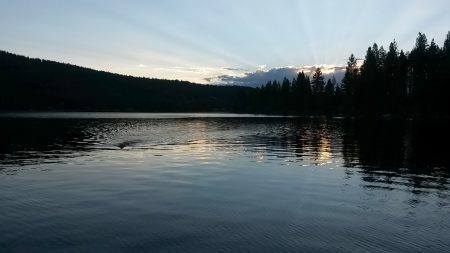 Having run Waldo 100K on August 19th, I was able to convince Abe to stand on a paddle board for up to three and a half hours to pace me while I attempted to circumnavigate Donner. So, ready or not, I was going to make the attempt on Tuesday, August 29th. Abe and I headed out to Donner at 5:30 on the morning of the 29th. Abe unloaded the paddleboard and I put my wetsuit on. 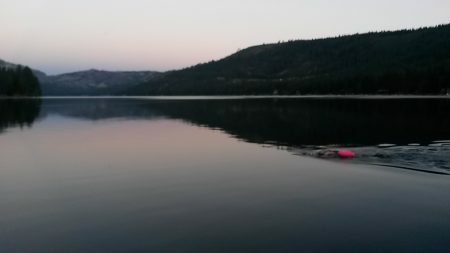 We entered the water at 6:09AM – while it was still pretty dark. Swimming the perimeter of Donner gave me an entirely different vantage point of the homes and area surrounding the lake than what I had experienced while running around the lake. The contrast was remarkable. Above the water, I got a tour of the homes, piers and landscape surrounding the lake. Below the surface, there is a whole otherworldly landscape. Huge granite boulders, tiny white shells, fallen trees, crawfish traps and the occasional human artifact suspended in the depths. I even saw what I think is an aquatic moth. Once the sun came up, the rays of light illuminated the deeper sections of my route and even proved to be a navigation tool. I found that I could tell if I was headed in the right direction depending on the angle of the rays. My mind didn’t wander once. I had anticipated that the swim would almost be entirely devoid of sensory stimuli, but it was completely the opposite. I was hyper aware of the visual and auditory surroundings as well as the temperature changes in the water and even changes in how the water smelled in different areas of the lake. Having Abe pace me on the paddleboard provided me with a sense of safety and security that I wouldn’t have had otherwise. I knew he was watching for ski boats so I didn’t have to. Seeing him when I turned my head to breathe allowed me to relax and enjoy the entire experience. Three hours after entering the water, I drunkenly stumbled out of the water. 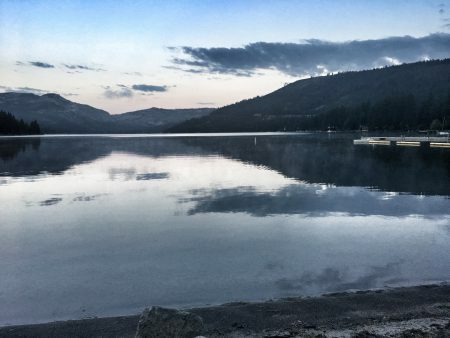 Holy crap – I actually did it – I swam 6 miles around Donner Lake. As soon as I stopped moving I started to shake and shiver uncontrollably. Abe had to help me out of my wetsuit, and my neoprene booties. He wrapped me in a blanket and poured me a hot cup of coffee. I could go on and on and gush about how amazing and wonderful he is, but it makes him uncomfortable so I’ll just say he’s amazing and wonderful and leave it at that (sorry honey – I had to say something). So, as much as I really really really hope that Running and I will get back together one day soon, I’ve fallen in love with Swimming and Biking as well.